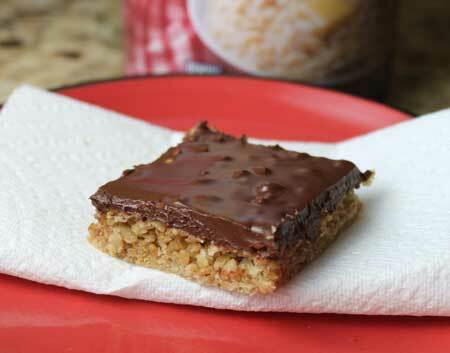 Today’s O’ Henry bars were inspired by a candy bar introduced in the 1920s called Oh Henry! Made with peanuts, caramel and fudge, some say Oh Henry! was named for a boy who frequented the Williams Candy factory in Chicago, where the bar was invented. Nobody really knows, but claims that it was named after the author or the baseball player have been refuted. If making these gluten-free, double check all ingredient list and make sure every ingredients is listed as gluten-free. Preheat oven to 350ºF. Line inside of an 8 inch square metal baking pan with foil and spray foil with baking spray. Cream the butter, salt and both sugars. Stir in the syrup, vanilla and the oats. Press mixture into the pan and bake for about 18 minutes or until edges are lightly browned. Let cool. It’s best to let it cool completely, but I’ll admit to putting the topping on while these were still warm. Oh wow, I discovered O’Henry bars when I went to Canada and for 2 weeks I became seriously addicted. To come back to the UK and do cold turkey was terrible 😉 I’m definitely going to give your recipe a go – thanks for igniting some wonderful memories! I’ve never had an O’Henry bar, but these look delicious. Do you think they’d turn out using creamy peanut butter? My kids don’t like crunchy, so I routinely just buy creamy. I *think* these are similar to some bars our college dining hall used to make that i LOVED! can’t wait to try! These look delicious, and the story of their origin is really interesting. This is one of the “family” recipes that made it into my “going away” cookbook that mom made for me when I went away to college many years ago. We make up a batch at least a couple time a year and mix things up by using milk chocolate chips and creamy peanut butter. We use Karo syrup in place of the corn syrup, too. Never had an Oh Henry bar but these bars look very tasty :)! Good heavens! I’d completely forgotten about Oh Henry bars! This recipe looks great, Anna! I feel like I’ve made or eaten these bars before, but I can’t remember. Regardless, they sound delicious. I am bookmarking this recipe! This looks great, and I see its also egg-free. With the peanut butter, oats and chocolate, this is another “must try” for me. I like chocolate and peanut butter frosting-these look addicting. Never had an O’Henry bar. Plus PB and oats are healthy so I consider this bar a “health” bar. I’m not sure, but I think we can still buy O’Henry candy bars. But maybe I made that up. I’ll have to look in the candy aisle. My mother used to make these. I LOVE them. everything that has peanut butter inside tastes delicious, i’m totally addicted to peanut butter. i noticed that they have also oats, i think i’ll try to do them with those old fashioned, anyway, cause i love them more than quick cooking ones. yes those do look really good. these are a keeper anna.